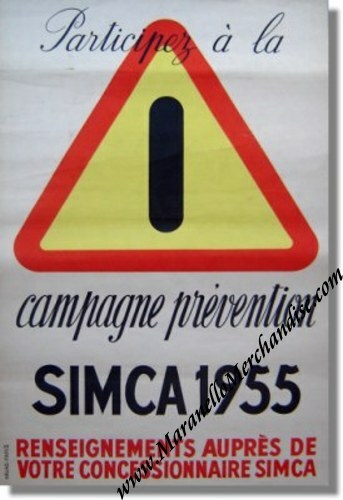 1955 Simca ''Campagne Prevention'' Poster - Vintage Original. This is a great VINTAGE poster from 1995 that calls to participate in the 1995 Simca Campagne Prevention (a safety campaign). Information could be gotten at your nearest Simca agency. A wonderful vintage item from a nearly forgotten brand. The poster measures some 39 x 60 cm or 15.5 x 24 inches.